Well I finally got home to Perth (6 weeks in Brisbane) and ripped open my care package from Melbourne. Yemen, Mexico, PNG, Sulawesi. Oh and some Qishr, the wife seems to like that but I'm not generally a tea person. The Yemen I roasted last night (450g, close to the max for the Behmor) and gave it an unusually long 14 hours of rest. As a SO flat white it shot straight to the top of my list of favourites. I will have to roast another batch, possibly two, immediately to have any chance of tasting it at age two weeks. I'm nervous about blending it but India Elephant Hills AA improves pretty much anything so I guess it's worth a shot. Andy, Dimal, greenman and 1 others like this. Working in Brisbane this week and have my first roasted batch of this Yemen sitting in the deep dark cupboard at home readying itself for my return . I must say I am excited for this week to be over not for the work to be done but to pulling that first shot of Yemen . Hardly wait !!!! I was mildly disappointed with my first effort, it came out at a higher roast level than I had expected (maybe due to the smaller beans?) Rested it a week before tasting, the roast characters were dominant at first but it improved greatly over the next week or so: hidden under the roastiness was a combination of raisins and dark chocolate which was very attractive. Pulled back the time post FC on the second effort and dropped it at a slightly lower temperature, roast looks better this time around but four days in it smells of peanuts which I associate with underdone topknot tragedy coffee so we'll see. Yeah looking back on the previous incarnations of Yemeni Ismaili a few years back, it's a little tricky to roast with almost inaudible FC progressing to SC and/or charcoal rather quickly. I was not very attentive and heard no cracking at all, I just dumped it when the smoke level indicated that the next phase of open fire was imminent. I will cool slightly sooner next time. Wow , over the years i` must of had 8 or 9 bags of Yemeni , mostly Ismaili and this is the pick .Recently i have been snatching up the Yemeni beans as with the war over there i`m worried they may dry up . Off the grinder they have that real funky over ripe fruit smell and then that last mouthful , all Xmas cake and cherry cough mixture ... i think . Andy and Dimal like this. I roasted another batch, 300g in the Behmor. This time I paid better attention so I could identify FC... at least I thought I would be able to. I heard exactly five FC 'pops', then once SC 'crack' and quickly hit cool. You really have to pay attention, I'm used to beans that announce FC a lot more. I bought the roasted beans and struggled with them at first, when they were about 5 days post roast. I opened something else and came back to them at 2-3 weeks and wow, completely different and really delicious. Patience is definitely a virtue when trying for the best these beans have to offer. Andy and chokkidog like this. This Yemen 19 is simply the best Yemen I have ever had. Actually, it is the best coffee in my ~12 years as a roaster. It is the sheer complexity of the taste that gets me. A very broad, smooth, intricate palette of flavor. I gaze vacantly into the distance as I explore the flavors flitting across my tongue. I never get to the drooling stage, that would be a waste of good coffee. Superb as a short black, perhaps better as a long white. My wife complains I drink too much of her long white before handing it to her. I could almost be converted to lattes, if I was more of a milk fan. Over the last decade, I have spoiled some roasts of this bean. It is easy to miss the second crack, and end up in an overdark roast. Too many winners to stop roasting it, though. With this wondrous batch, that issue got much easier. The first roast was in retrospect a little too dark, great as a short black, but lost a tad as a long white. Still great enough to enthusiastically buy 2 more bags! The second roast was 5 secs into second crack, and simply wonderful in both styles. At this stage I was completely happy, wondering about buying some more. I hit the jackpot with the 3rd roast, stopping it at the start of the faint but definite second crack. In early cooling, it went into a rolling second crack. WAIT TEN DAYS!!!!!! Yemen just doesn't mature for at least a week, roast a cheaper coffee if you need it real soon. It is a Grange of coffee. From 10 days post roast to over a month later, if there is some accidentally left over, it is at its peak. For a double shot of espresso, I find 24 secs for 2oz of black gold working very well. I may experiment, but really, I don't care as it is so good. Compared to really expensive coffees, like Jamaica Blue Mountain, Kona, assorted Central American beans, in my opinion this Yemen outshines them all, and a whole lot cheaper. $35.5/kg -> 25 cents per 7g of coffee per cup for a truly magnificent cup of coffee. I've heard a bit of the tale behind this batch of Yemen coffee getting out of war torn Yemen. I hope Andy does a post about that journey. The last couple Yemen arrivals were a bit disappointing. Good coffee easily drunk, but not great. I suspect that tragic war has disrupted everything. This year's is just magic. I hope it is not a lucky fluke. I have bought more of this Yemen 19 than any other coffee in my life. It will probably be 3/4 of my coffee drinking over the next year or so. Out of compassion I won't buy any more for a couple months to let others share in the joy. After that I won't feel guilty about buying more. You have been warned. I suggest you buy a bag, try it after resting the roast for 10 days, and then scramble to buy some more if your palette is anything like mine. Last edited by meander; 4 Weeks Ago at 12:01 AM. Andy, Dimal, simonsk8r and 2 others like this. This Yemen 19 is simply the best Yemen I have ever had. I thought the currently available coffee was Yemen 18. Coffea is autumnal so the 19 would still be on the bush (assuming flowering is finished). I wish I could share your enthusiasm, nothing but disappointment with this coffee so far. I can't get the balance right in the roast. Out of curiosity, for those who has had good results with the Yemen, are you roasting to around second crack? Am I doing a disservice to the Yemen if I drop it around end of 1st crack like I normally do for other beans (my usual preference)? The first roast was in retrospect a little too dark, great as a short black, but lost a tad as a long white. Still great enough to enthusiastically buy 2 more bags! After experimenting with a number of different profiles over the years, have found (for us), that relatively gentle profiles up to the edge of 2nd-Crack seems to produce the best results in the cup. As mentioned by several people above, the longer you can leave it sealed in a bag up to around 2-weeks, the broader and richer will be the flavour spectrum. DesigningByCoffee, Beanz., meander and 1 others like this. I use a Behmor roaster, 314g (1/8 of a bag of beans), set it as a 400g load, P1 till start of first crack, press C, then P3, and wait for the very start of second crack, say 3 ~ 4 soft cracks in, to be sort of sure they wern't left over first cracks. With my 3 roasts of this Yemen so far, first crack comes in with 5~6 minutes left on the clock, and second crack 1~1:30 minute time remaining. The variability is presumably due to the quite changeable temperatures in my outside roasting area. One evening was 30 Celsius, another was 20 Celsius. I'm somewhat embarrassed to confess that I don't vary my settings very much from bean to bean. My main variable is fiddling with when to pull the heat, either start of second crack or a bit into it. That is a little random as I can get absorbed in the book I am reading. I put the book down for these Yemen roasts! I'm sure I rebuy beans because they work with that profile for my palette. Thank God this bean is one of them! Arthur, who is a lazy roaster because so many of Andy's beans taste so good to me with this regime. Dimal, Beanz. and simonsk8r like this. relatively gentle profiles up to the edge of 2nd-Crack seems to produce the best results in the cup. Mal, you are talking about a gentler profile being good for this bean, can you explain that in Bohmor language? I'm a bit monolingual. Arthur, a bit unadventurous once he finds a great setting for a bean, has decided he might perhaps eventually like some variation with his stash of Yemen, especially if there is a chance it could be even better, or different but as good. Sounds to me mate that what you are already doing is producing the goods so I wouldn't change anything. Where the Yemeni beans catch people out is their density. I don't know of a denser bean than these and the Ismaili is even more dense than the Matari and other lower grades. Mal's slower ramp is a good way of dealing with the density, if you rush this one to the end you will singe the outside and leave the inner underdone. Arthur's heat to first crack then back the heat off till the start of second works because of the additional time added between 1st and 2nd cracks gives the bean enough time to heat through. Arab countries roast these to the sandy yellow stage, way before first crack and then add cardamom pods before grinding. If you can find a grinder to grind such an under-roasted bean I suspect you wouldn't like it. I bought some back from the UAE years ago and had to argue with AU customs to get them in as they thought they were raw green beans. It's an interesting local take on coffee but not something I would recommend. The Yemen Ismaili works wonderfully as an espresso, start of second crack is my preference but due to their density they will stand a much deeper roast depth too... as long as you don't rush the roast. I personally don't think the lighter roasts work for this bean but maybe I've just missed the correct profile. If you are not producing a stunning coffee then change your roast technique and as suggested in the posts above, rest them longer. I've had Yemen roasts really pop in the 3rd and even 4th week after roasting (again due to the density, they age slower). These are amazing beans if you adjust your technique to get the best from them. DesigningByCoffee, Dimal, Beanz. and 4 others like this. That's interesting, I'll try a slower ramp. 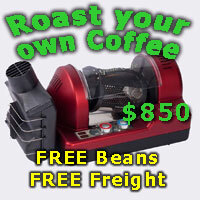 Can you explain why a denser bean causes roasting problems? The implication is that it is more difficult to heat through but this is not likely to be the case: thermal conductivity in plant materials is positively correlated with density, whilst thermal diffusivity stays more or less constant. To see why this is the case think about heat transmission as the propagation of kinetic energy. These material are mixtures of solids, lipids, water and voids or air. At a given moisture level the denser materials contain more solids which will transmit kinetic energy much more readily than the air pockets. Oil complicates things but I gather that the oil level in coffee exhibits a fairly narrow range so it is unlikely to be a major factor. Last edited by Lyrebird; 3 Weeks Ago at 01:23 PM. If you are not producing a stunning coffee then change your roast technique and as suggested in the posts above, rest them longer. Dimal, Javaphile, chokkidog and 2 others like this. Happy to leave it for more experienced roasters. As for getting hung up on "why", different people learn different ways. I like to understand what is actually happening rather than changing things blindly hoping for a better result. As a result of this, if someone posts an explanation that appears to defy the laws of physics I will ask for clarification in case I didn't understand what they meant. Last edited by Lyrebird; 3 Weeks Ago at 10:50 AM. simonsk8r and magnafunk like this. So I've been thinking about this while I clean tanks (oh the glamour of winemaking) and I have a hypothesis. If we accept the observation that dense beans can be more difficult to roast evenly, one possible mechanism that could casue this has to do with the mechanics of first crack. First crack appears to occur when the internal water vapour pressure exceeds the mechanical strength of the bean structure and the bean suddenly expands. If we assume that denser beans have a higher level of solid material it follows that they should be mechanically stronger. In any case smaller beans like the Yemeni will require a higher pressure before expanding for the same rmechanical strength (the pressure is spread over a smaller area). From this it follows that the timing of first crack will be influenced by the density of the beans, occuring at a higher pressure which corresponds to a later development stage in the roast. This would mean that denser beans subjected to a typical profile (ramp to first crack then slower rate of rise to give some development time before dropping) would have a higher energy input at the top of the profile than would a less dense bean, which appears to fit the observations. Last edited by Lyrebird; 3 Weeks Ago at 04:31 PM. I too have not found the right profile with this bean, and usually roast on the lighter end of the scale. Wasn’t happy with result in cup even after 2-3 weeks rest. I’m ready for round two so given comments above, will take later and see how I go. Not my area of expertise at all, I simply go with the quality of coffee in the cup. The contradictory thing is though, that some beans identified as High Density SHB, say from Central America, often produce better results when roasted with a faster profile, not slower. I just don't believe that there is a satisfactory explanation that deals with all scenarios for all beans. There seems to be plenty of exceptions to any rules that roasters like to promote. greenman, Javaphile, Yelta and 2 others like this. It could be that bean density is not actually relevant, it's just easy to measure and loosely correlated with something else that is relevant (like mechanical strength in the hypothesis above). In woods, for instance, density, stiffness and strength are loosely correlated, but if you divide one by the other to get the stiffness to weight ratio you get quite a large range: in Eucalypts alone rose gum is about 26 (MPa.m^3/kg) whilst river red gum is about 12. To me the learning from this exercise is that the idea that first crack is a reliable indicator of the beans being at a particular stage of roast development is now deeply suspect, somewhat analogous to learning 30 years ago that sugar level was not a reliable indicator of ripening stage in grapes. If nothing else that will help me learn how to roast. Lyrebird......you related to TampIt ? Andy, Javaphile, Stan and 4 others like this. I was told a ramp roast is way better for these beans by a guru many years ago. I still do this ritual with these and it works the best way for me in the GC. This is up there with the best Ismaili coffee I've ever had the pleasure of drinking. Gonna try to make my meagre single bag of Yemen last as long as possible. Andy and NJD like this. For what its worth i am drinking a reasonably light roast of this from day 3 onwards. Its working well for filter and could do with another 30sec for espresso. 14% moisture loss, profile attached, small gas drum, low to moderate fixed airflow. V60 2cup, 18g dose, 285g water at 92C. 60g bloom, 2nd pour to 170g 3rd to 285g. I botched my first 2 attempts, as Andy mentioned i was caught out by how much heat these dense little guys can take very early on. In the successful roast attached i started the same heat setting as a Kenyan. At 130 started slowing the roast by slowly backing off heat every 5C up to 150. This gave a nice uniform yellow. I left them alone until 170 -175 where i started backing off the heat again up to 185. At this point i was down to the setting close to what I use to finish a dry process Ethiopian. Not the loudest first crack, which seemed to give a not too abrubt decline. My first roast i had much more vigorous first crack and the ROR crashed steep and fast. I am getting sweet honey, stewed / jammy dried fruits with very subtle hint of mixed spice. Its a good coffee for cooling of the weather and is perfect match for my spiced fruit sourdough bread. Its quite distinct but in a comforting and mellow way. Delicious! OK so I lied when I said I'd leave it to you guys, I've just bought another bag. 16 days in on the last roast from the first bag I bought and this is looking really interesting: lovely intensity, complex flavours and great length. The key for me was changing the way I calculate development time. Last edited by Lyrebird; 1 Week Ago at 12:21 PM. There were a few clues in this thread. #7 GeoffR - "came back to them at 2-3 weeks and wow, completely different and really delicious"
#9 meander - "From 10 days post roast to over a month later, if there is some accidentally left over, it is at its peak"
#12 beanz - "I agree that it improves in the 10 - 14 day range but I would never be able to make it last a month"
#13 dimal - " the longer you can leave it sealed in a bag up to around 2-weeks, the broader and richer will be the flavour spectrum"
#17 Andy - "rest them longer. I've had Yemen roasts really pop in the 3rd and even 4th week after roasting"
#20 Andy - "If you are not producing a stunning coffee then change your roast technique and as suggested in the posts above, rest them longer." #29 NJD - "Tried it after 7 days and didn’t enjoy it , but the last few days WOW!!!!!! " It really is worth taking on board (and listening to) suggestions and tips posted by people who are getting great results. The only real way of determining rest time of a roast is sensory. Depending on your batch size, try it every few days through the bell-curve of improvement until the aromatics drop off. You might be able the recycle that data the next time you roast this particular bean to give you a starting point. Dimal and flynnaus like this. I meant development time during the roast. Sorry if that's the wrong term but it seems to be fairly commonly used. Saved a word and it becomes ambiguous. The only real way of determining roast development time or rest time of a roast is sensory. There is really nothing to calculate until you have the sensory data of a good result. "taste it, make a note, taste it, make a note, make a change, taste it, make a note"
--continue till you are kicking goals then use your data to try and replicate a good result. There's a great deal to calculate if we start with the idea that the Maillard reactions follow Arrhenius kinetics, which is well supported in the literature. But should we start with that idea, or should we stick with Andysius Sensory Theorem? Namely "If you are not producing a stunning coffee then change your roast technique and as suggested in the posts above, rest them longer." Lyrebird, would I be right in guessing that when you make wine you don't get a bunch of virgins to step on the grapes and then throw the result liquid in a bottle? We should take this to another thread, but there's a huge difference in the technical understanding of wine compared to coffee. As I see it coffee is now about where we were with wine in the middle of last century. The way forward, however, will differ: wine was driven by excellent research institutions in Australia, USA, Germany and France. The interwebs has changed everything and I think there is a genuine opportunity to use the collective power of groups such as the CoffeeSnobs community to make some progress. Last edited by Lyrebird; 1 Week Ago at 06:06 PM. The way forward, however will differ: wine was driven by excellent research institutions in Australia, USA, Germany and France. The interwebs has changed everything and I think there is a genuine opportunity to use the collective power of groups such as the CoffeeSnobs community to make some progress. Why not start a 'science and coffee' thread? The difference in 'technical understanding' partly reflects the difference in the nature of the 'products' you are describing (and the nature of their production). There is no fermentation involved in coffee roasting or brewing, the mixing with water occurs at the point of consumption, wine is a finished good and is not typically mixed with milk in retail establishments, and land under wine grapes earns much higher yields than land under coffee plants (for a variety of reasons). For these and many other reasons it makes perfect sense that there has been a massive investment in research in wine. I presume that you are familiar with the Illy book on Espresso Coffee? From the latest stats I can find, a hectare of coffee plantation in Brazil (the largest producer) yields about 1500 kg at about $AUD 3 per kg, so that's $4500. A hectare of grapes produces about 20 tonnes in areas such as the Riverina, but prices there are low, $300 - $400 per tonne. Now that's $6000 - $8000 per hectare but given the cost of living differences the Brazilian is ahead. Places with a focus on highest quality (like where I am in Beechworth) prices are about ten times the Riverina but yields are much lower and sites are much smaller. A similar argument can probably be made about places that focus on highest quality beans such as the ones from whom Andy buys. Andy, DesigningByCoffee and Dimal like this. I’m just about to roast my first batch of these and I’ll follow the advice of the wise - slowly to just before/on first crack. Update to follow! I must admit, I have tried Yemen previously, but never thought there was really much to write home about, but I'll be more then happy to be proved wrong with this batch! If guys like Andy & Mal swear by them – I must have done something wrong in my roasting back then. So I've roasted up 750g, slowly to just on the first snaps of second crack at around 221.5°, giving 2x 280g in new bags for good resting plus around 100g for sampling sooner. I don't know how it will taste compared to the roasted flame maple I tried last week — but I'll let you know! Dimal, samuellaw178, simonsk8r and 1 others like this. Now all you have to do is leave 'em alone before at least 10 days have past and that's much more difficult than the actual roasting.